The Clean and Simple Challenge at Splitcoaststampers today is "Memories". To think of something from the past, think of a previous technique that you loved, or a card from your past that you would like to revisit, which is my choice. This is the card I decided to revisit, which I did in October 2015 and is appropriately named "Go After Your Dreams". Back in September 2015 I was what I call a "WW" a wannabe watercolourist. After much self debate I decided to enrol for some classes locally. It has been one of the best decisions I have ever made, for several reasons. It is a fun class, my teacher is amazing, and the rest of the ladies in the group are such fun. Yes, I continue with classes to this day, and yes I continue to learn. On to my 2018 card. 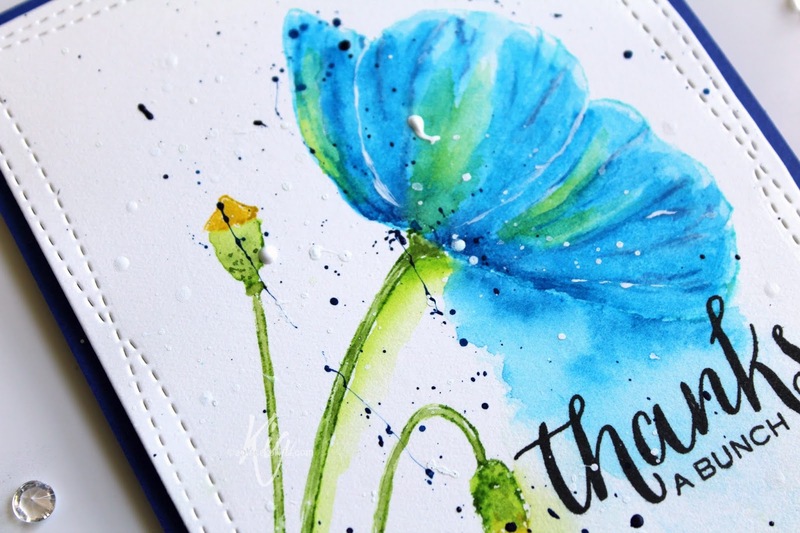 I am using the same stamp by Penny Black called Poppy Time. 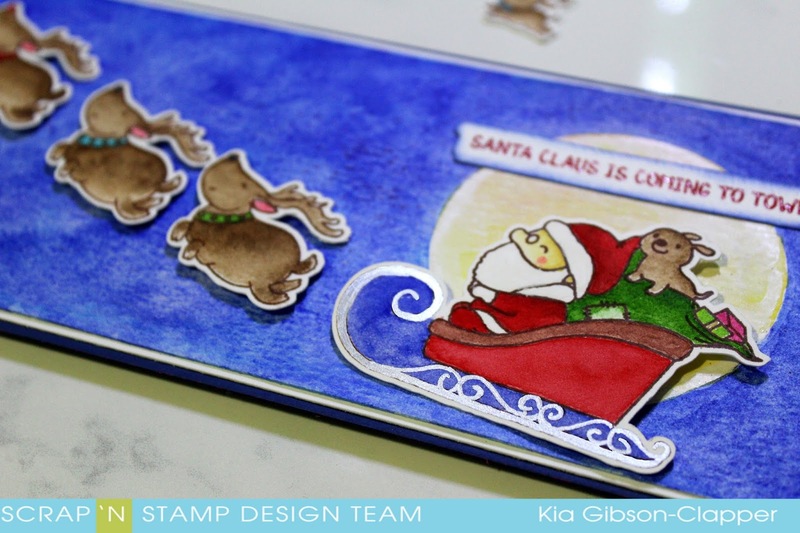 I did not stamp it per say, I coloured the stamp with my watercolours to get the outline. I then proceeded to add about 4 layers of watercolour drying in between each layer. I dragged some of the paint from the flower down, which I also did along the stem . I wanted the look to be a bit loose. 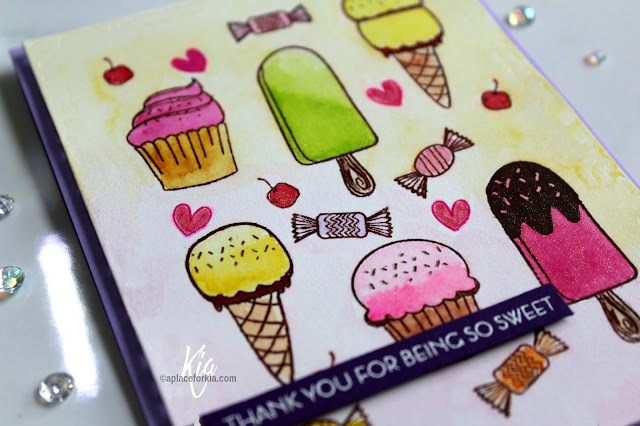 I die cut the panel with my wonky rectangle die and in my mini Misti I stamped the sentiment using black ink. To finish, I splattered with a dark blue and white acrylic paint, and had a sneeze in the process - oops, those long lines were not intended, but I like them as it turns out. For dimension, I attached the panel to a dark blue card base using fun foam and Scor-Pal tape. Thank you for visiting today. I do hope you have enjoyed this card. 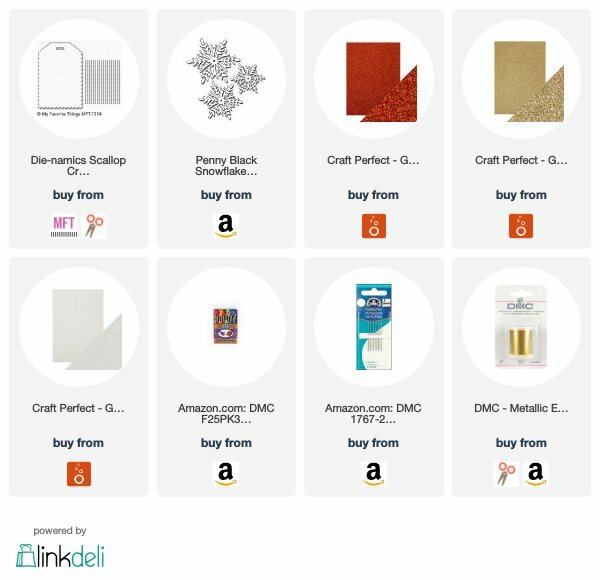 I have provided links to the products used below, at no cost to you. This is such a change of pace from Christmas, and oh so fun! I have had this stamp set from Altenew for awhile, yet this is the first time I have inked it up. I started by doing a light wash using pink and yellow watercolours for my background. I arranged the stamps in my Mini Misti and stamped using Ranger Jet Black ink on watercolour paper. I then proceeded to watercolour using mostly yellows and pinks, with a bit of green and red. 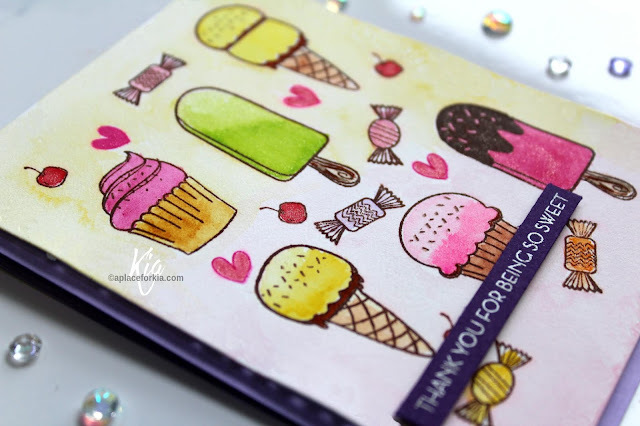 I did add a light orange and light violet on a couple of the candies. Once I finished the stamping and painting I went over the ice cream, popsicles and muffin tops with Wink of Stella. I stamped the sentiment on purple cardstock and heat embossed with the white embossing powder. 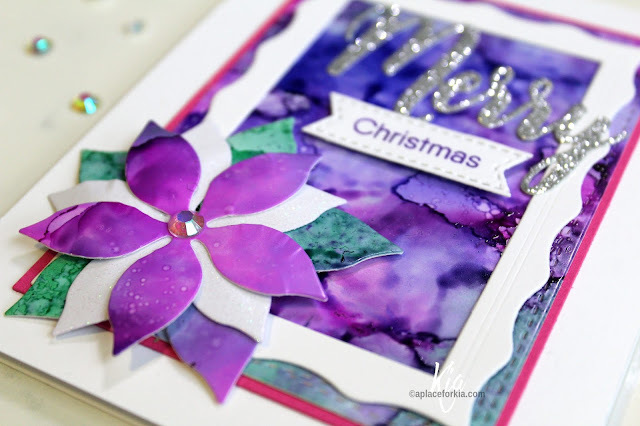 I attached the panel to my Violet card base with fun foam, and added the sentiment strip using foam tape to finish. 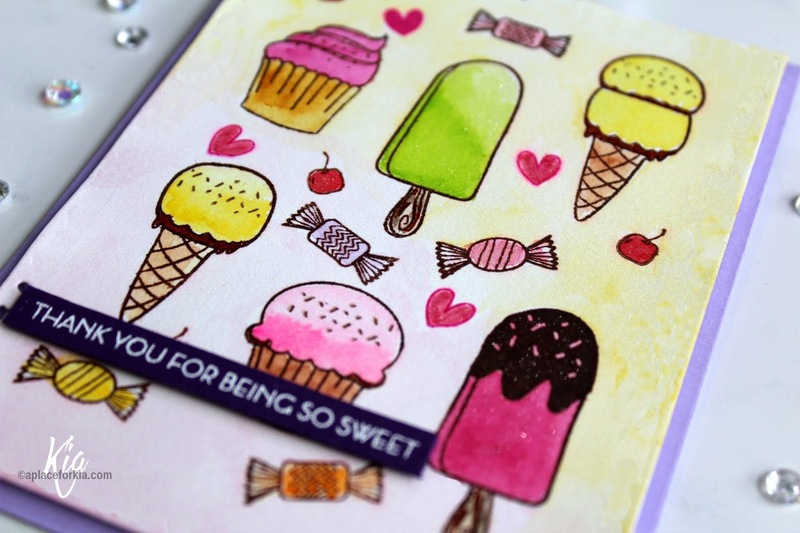 Thank you for visiting today, and I hope you have enjoyed this card. A card I made for Frantic Stamper highlighting Valentine's and Love. 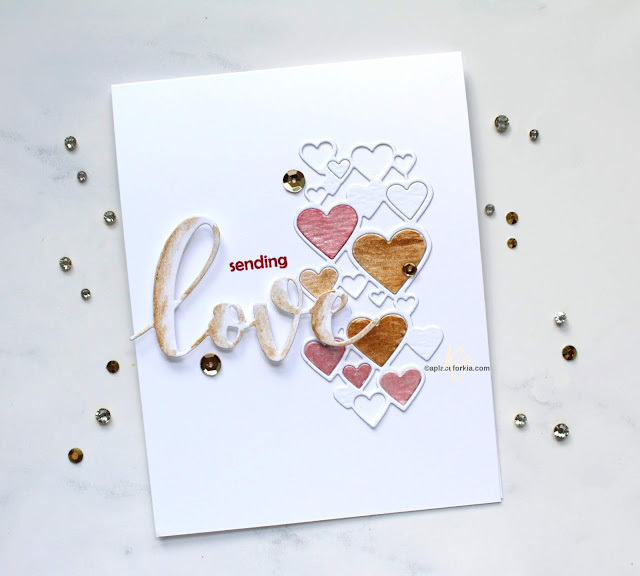 I love the cascading hearts die, and the font on the love sentiment die as well. 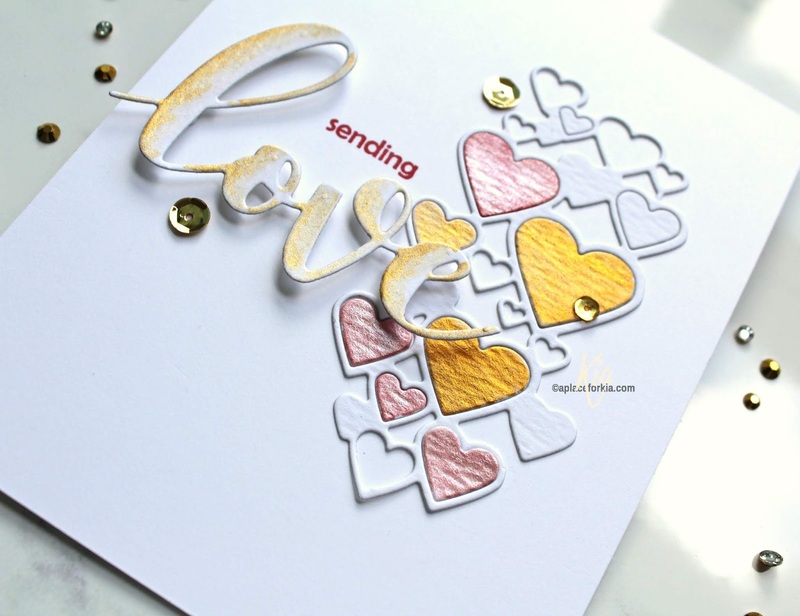 I die cut the cascading hearts using Ranger Distress Watercolour paper as I wanted some texture for the hearts that I left in. Using my Gambi Tansai sets of watercolours, I painted a few of the hearts in the pink pearl and the No. 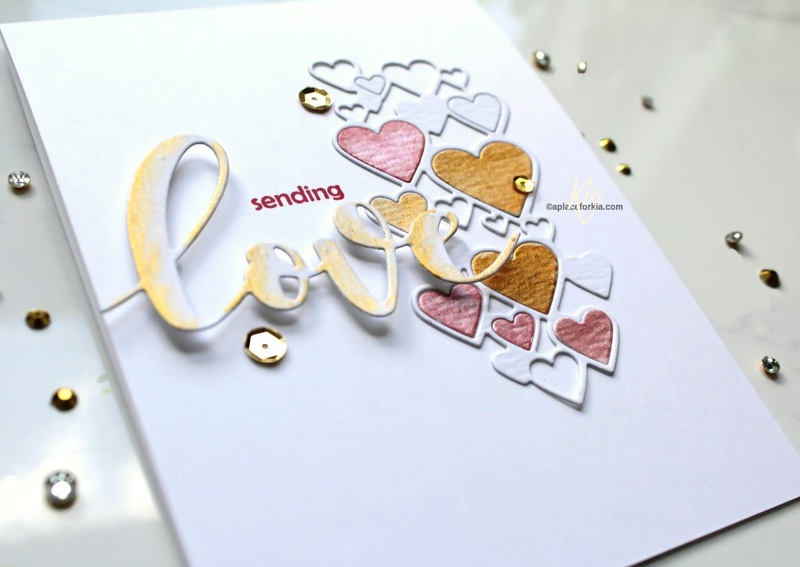 2 Red Gold watercolour, then glued the hearts down with Nuvo glue. I die cut the love using the same paper and added Champagne Gold around the edges and attached using foam squares. I finished by stamping the sentiment in my Misti using Ranger Vermilion ink, then added a few gold sequins. 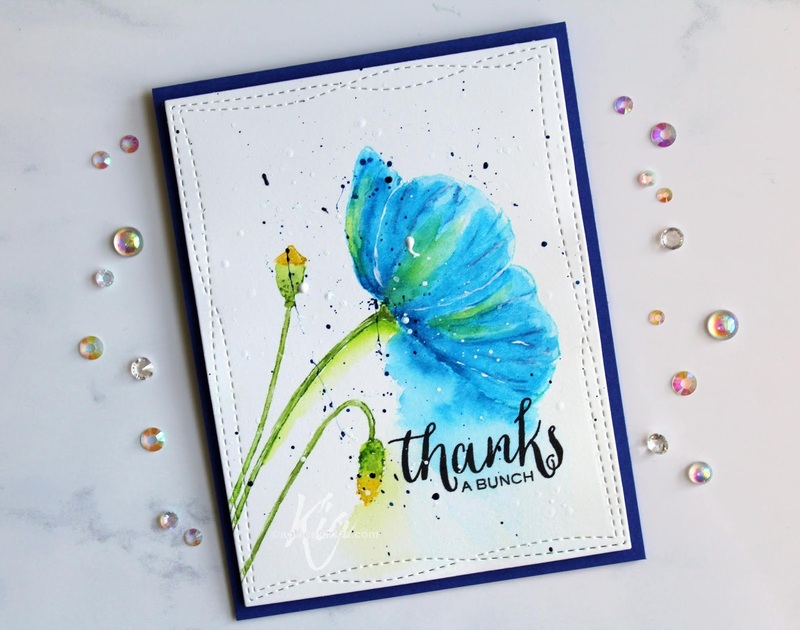 I hope you have enjoyed this card, and wish to thank you for visiting my blog. 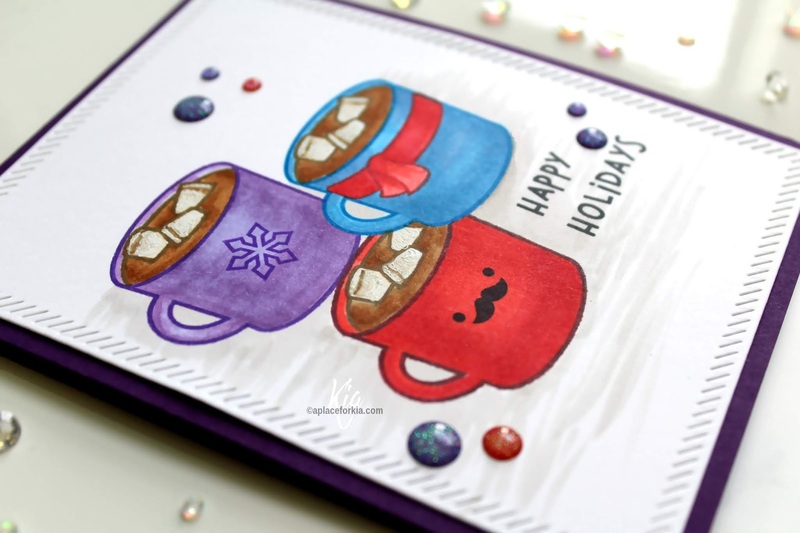 The Clean and Simple challenge at Splitcoaststampers today is about "stitched". 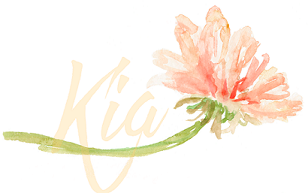 This is not CAS as we all know it, yet there is ample white space. So, close enough to CAS for me. 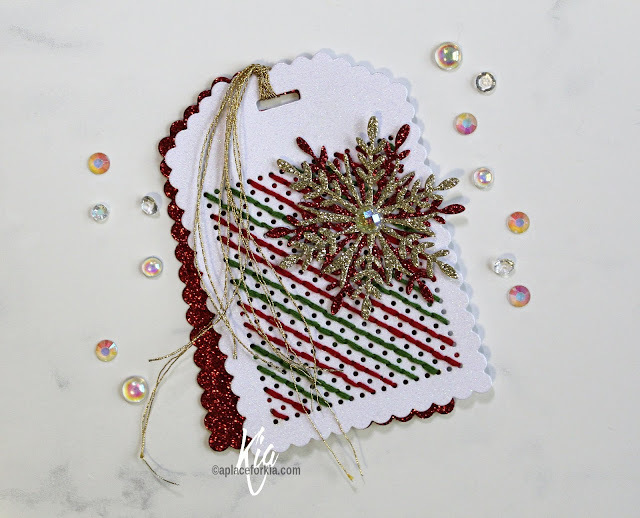 I used My Favorite Things Scallop Cross-Stitch Tag die, which I used to cut the red back panel, and white glitter cardstock to cut the cross stitch panel. For the white panel I added the cross stitch plate to the die. Instead of doing cross stitch I did back stitching in rows, leaving white space in between each row of stitching, which is done in Christmas Green and Christmas Red. 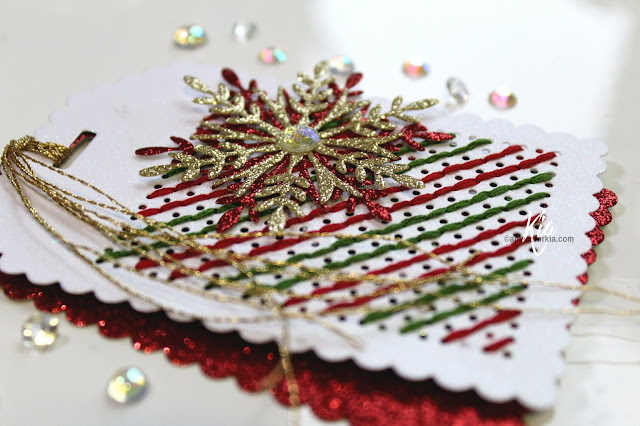 I die cut two snowflakes, one from the red glitter and one from gold glitter cardstock, and glued them together. I then glued the snowflakes to the cross stitch panel, added square foam dots between the white and red glitter panels to keep the top panel in place and for dimension between the papers. To finish I tied with gold thread and added a crystal gem to the center of the snowflake. In case you are wondering, I use DMC thread, which is made in France and a #24 Tapestry Needle. I have linked to one of the kits that I have in my collection below. Thanks so much for visiting today. I have supplied affiliate links to the products used below, at no cost to you. Masculine cards are not my favourite style to do, and I do not do enough of them get a flow going. 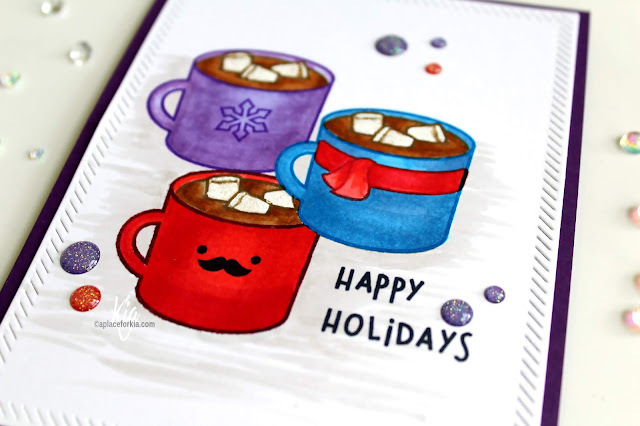 But I thought these mugs, particularily the one with the moustache, made for a fun masculine Christmas card. 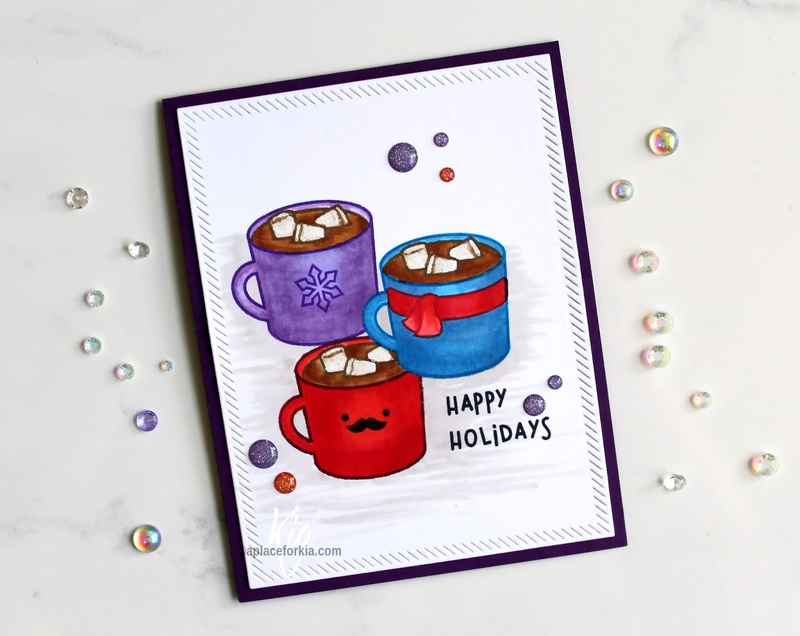 Using my Mini Misti and Neenah 110lb cardstock, I stamped using the colour of ink that I would be colouring the mugs in, hence red, blue and purple, masking the mugs as I stamped. I then stamped in the marshmellows. I coloured using Copic markers in a few shades of the same colour, and used white gel pen for the marshmellows. I added the moustache and snowflake after I finished the colouring, along with the sentiment, and die cut the panel. 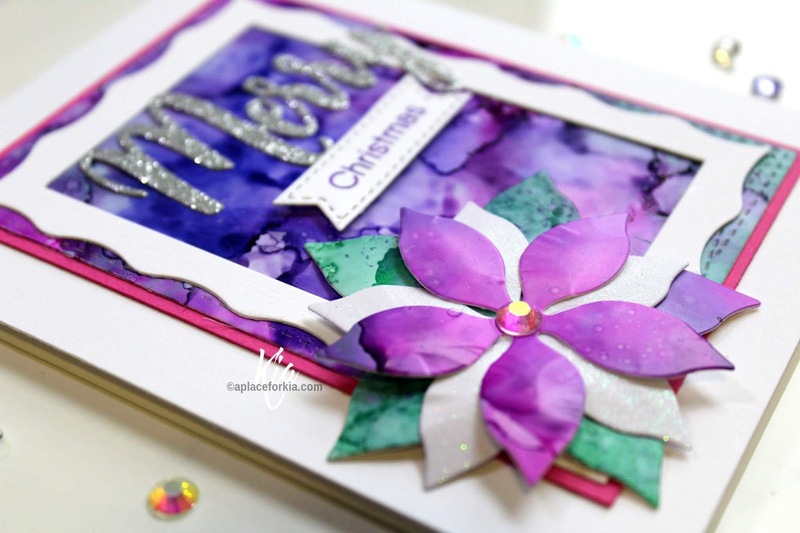 To finish I attached to a deep purple card base and added a few sparkly gumdrops in the reds and purple. A man needs a bit of sparkle too! 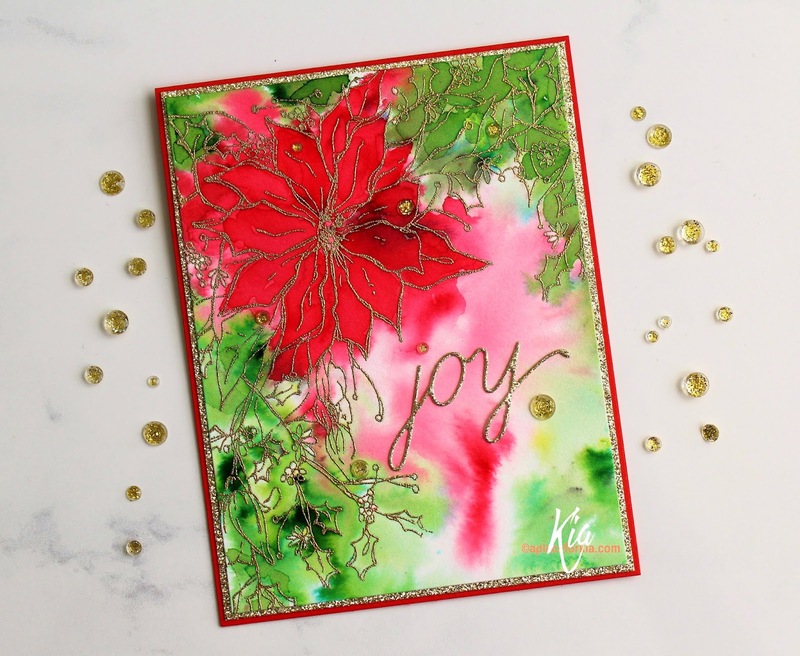 I am back with another Christmas card to share using a die cut Poinsettia done using alcohol inks, as is the background. 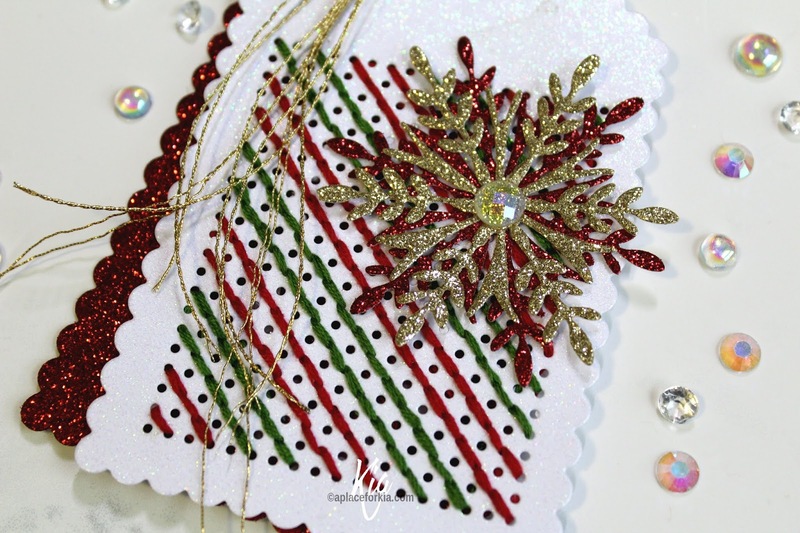 This card is all about the layers, yet there is enough white to keep a clean balance. I used the purple, pinks and greens for the background which I did on a 5x7 piece of Yupo so I could get the background and the flower cut out. The background panel is die cut using my wonky rectangles, then matted with a bright pink cardstock and attached to the white base. I die cut the frame from the white and attached directly on the background panel, the die cut the flower petals using the green parts then the pink parts of the Yupo piece. I also added a petal layer using white glitter cardstock. 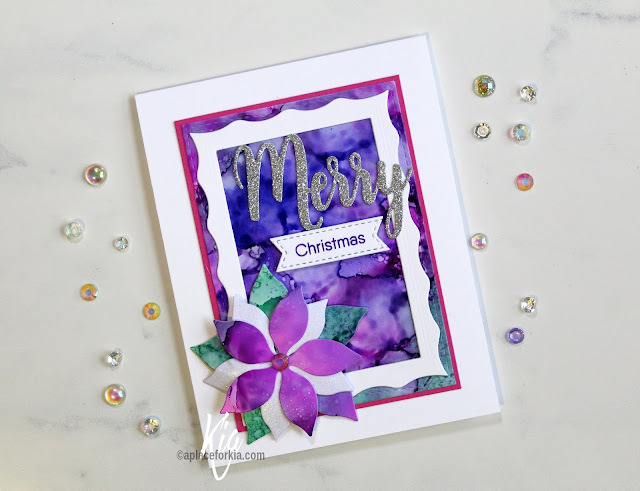 I finished with the Merry cut in silver glitter cardstock, and the Christmas stamped in the purple and die cut, then attached using foam tape. And finally, a crystal gem for the flower centre. I very much like the results, and I think the recipient will as well. It certainly is not long before Santa starts his journey to all the homes for Christmas. 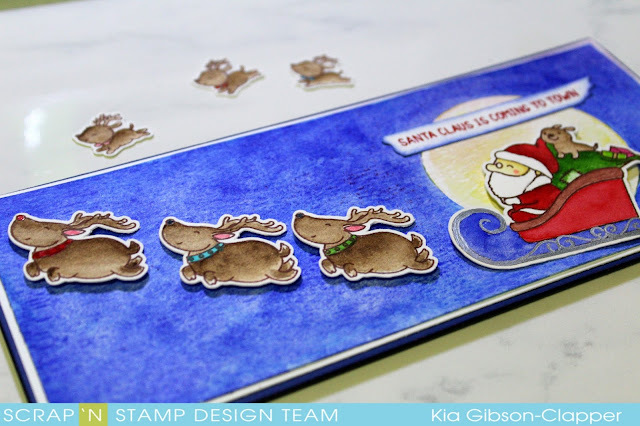 For this card I used the adorable set from Mama Elephant called Santa's Sleigh. I mixed it up by water colouring with Gansai, Color Burst and Distress Inks, and I also used silver pen on the sleigh rails. Rudolph also has a red nose, and it has a shine with some Wink of Stella added. 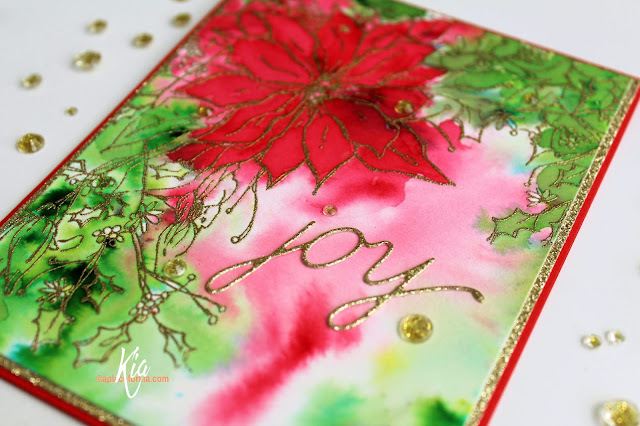 I stamped my sentiment in red and heat embossed with clear embossing powder. Once I was finished with the background I went over it with the Micro Glaze and buffed it for a shine, which is hard to see in the picture. 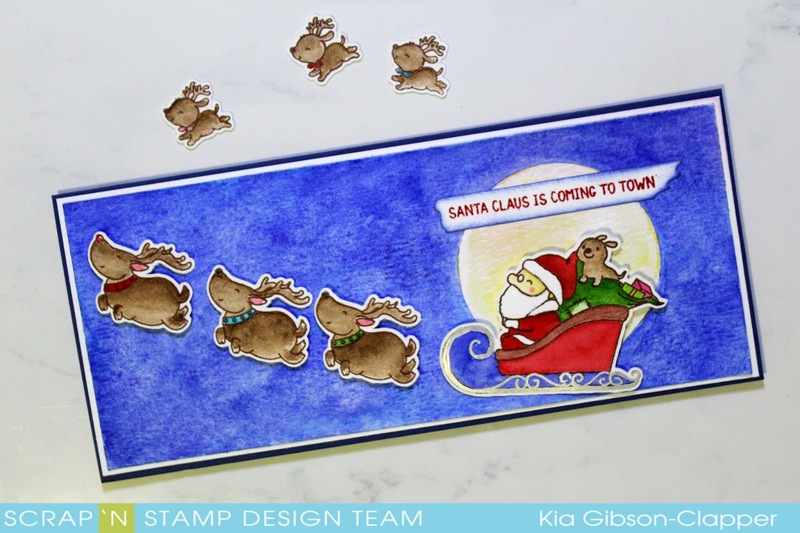 I attached the sentiment with glue, and attached the dogs and sleigh using foam squares. My friend wants to give this card to her hubby, and it fits perfectly as they have 3 dogs. The little dogs shown in the picture I will use on the inside. I am finally getting some of my own Christmas cards done. Better late than never! I have not used this stamp yet this year, so thought it time to bring it out for a special friend. 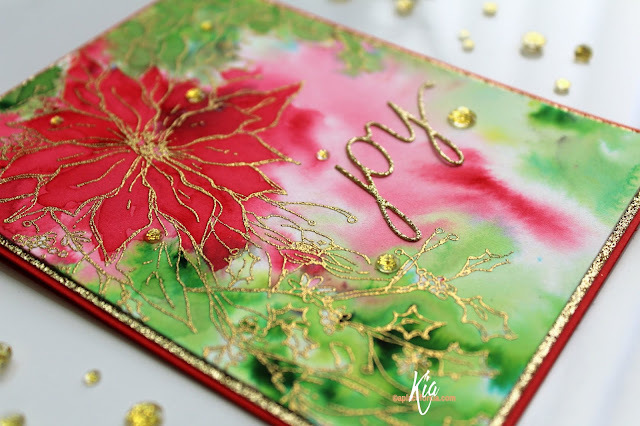 In my Original Misti I stamped my image on watercolour paper using Versamark embossing ink, then heat embossed with gold embossing powder. I used Ken Oliver Color Burst for the card, in Lime Green, Fuchsia and Alizarin Crimson. I spritze my panel first, then add the powders and spritzing more where I think it needs it. I then set it aside to dry. I wanted more sparkle, so I used a red card base and gold glitter cardstock to mat the watercolour panel. 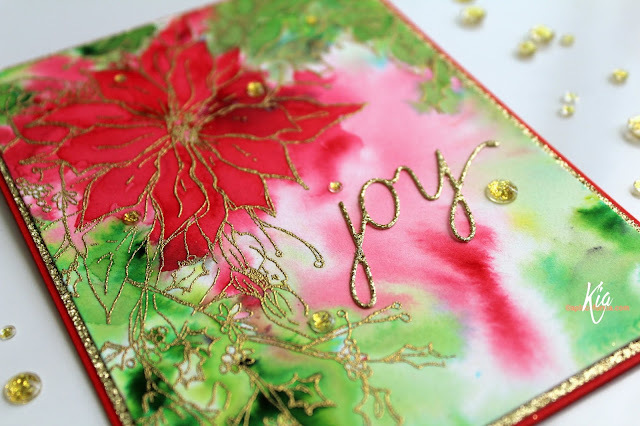 I die cut the Joy sentiment in the glitter cardstock, and finished with a few crystals. My sentiment is several years old, but I still love the loose style of it. 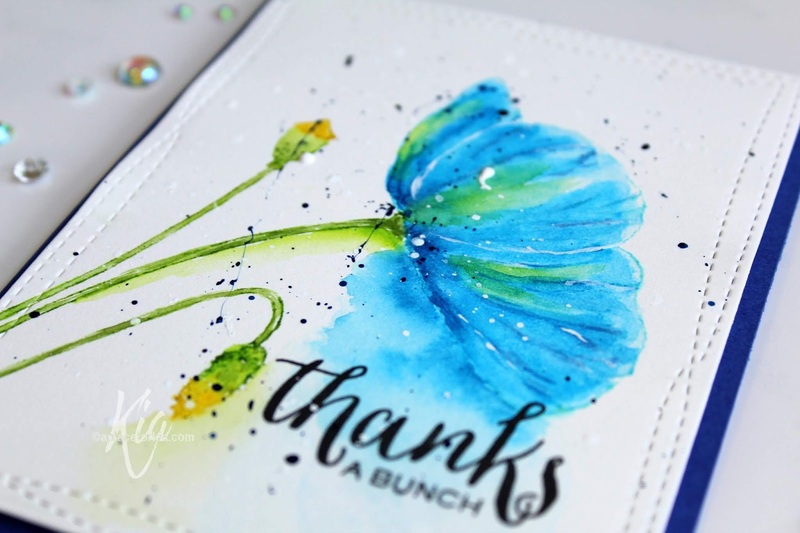 I have linked to another sentiment below that I think would look wonderful on this type of card as well. 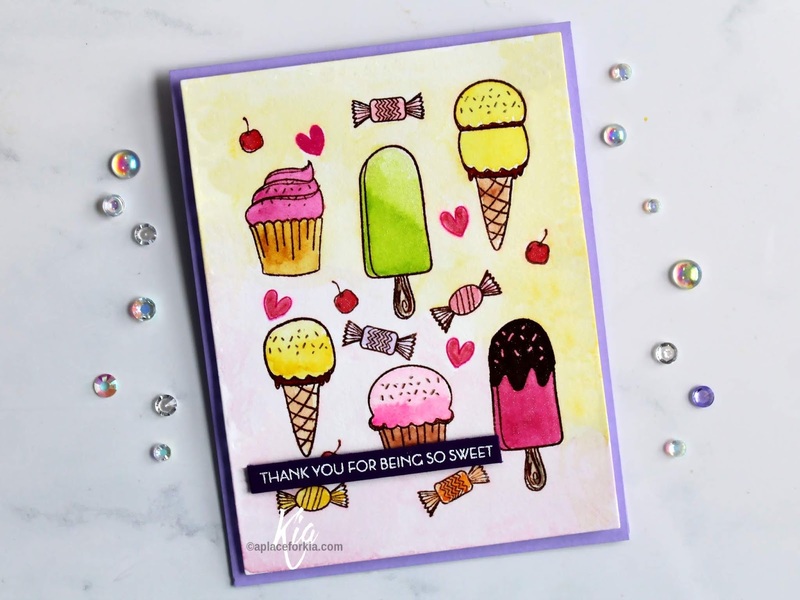 I hope you have enjoyed this card today, and thank you for visiting my blog. Have a great day! 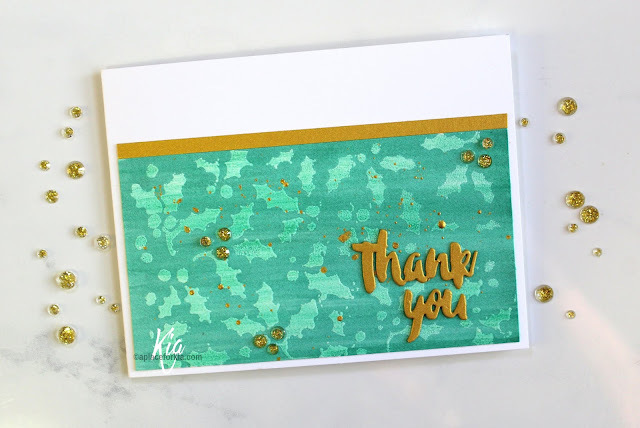 I watched Jennifer McGuire's video on Alcohol Ink Emboss Resist and thought I would give it a try. 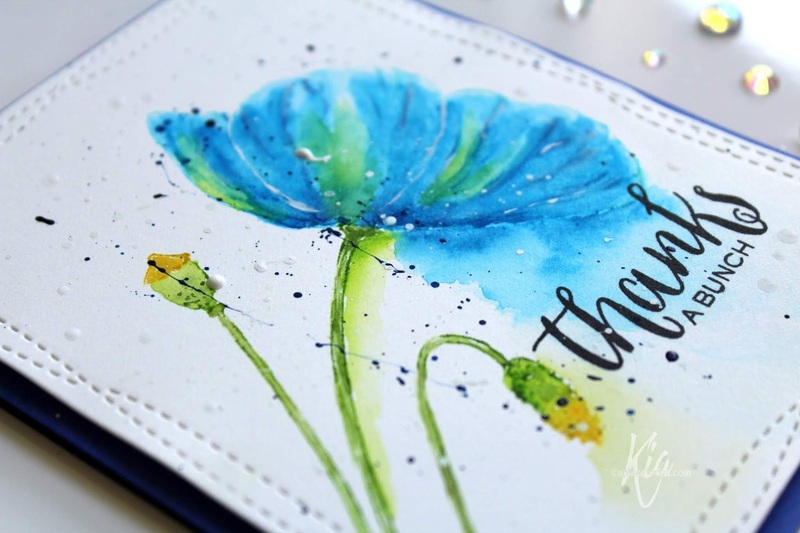 I first swiped Versamark embossing ink over my stencil on watercolour paper, then heat embossed with white embossing powder. Using my ink blending tool and felt I added the alcohol inks to the felt, using Pistachio and Clover along with some Blending Solution, then swiped back and forth across the panel. I did not use any of the Mixative as I wanted to splatter my piece with gold ink instead. I cut my piece for my card front. 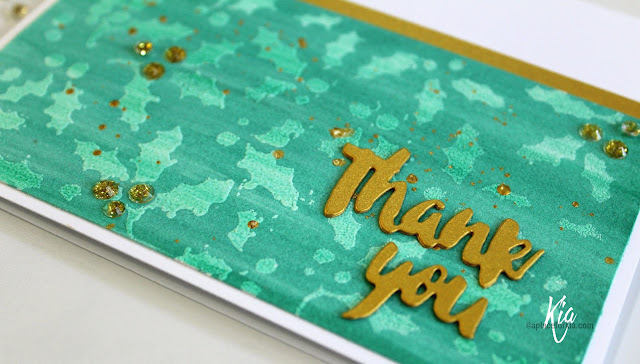 The using Altenew's Majestic Blooms Thank you die, I cut the sentiment two times for stacking, along with the gold matting piece from gold metallic cardstock. I covered the top of my card and splattered with the gold ink, then glued on the stacked thank you. 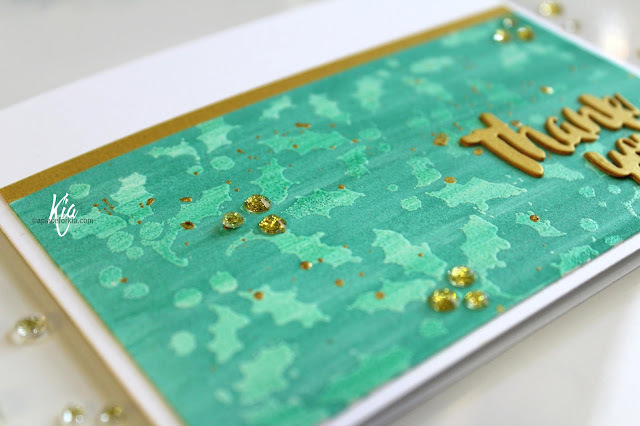 To finish I added a few gold sparkle crystals to the card, which I think finish it perfectly. 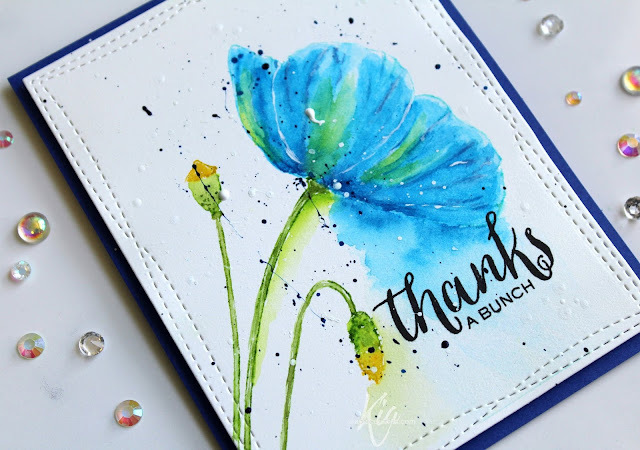 I hope you enjoy this card and wish to thank you for visiting today.